Steve Daly from Street Crocodiles, Wolfpack and The Colts was also in Psuedo Blue! This pic is of me playing Bass in Psuedo Blue a band I formed late 70’s new wave era ( thats the reason for the dinner suit!!) This gig was at The Junction harbourne. 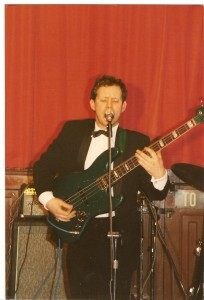 The bass I am playing is a 1966 Fender Jazz Bass Custom color in Sherwood Green I bought it in 1976 and I still have it!! It’s a very rare beast I have always called it ” The Green Godess” the only other one I have seen belongs to the Bassist of U2 but his has the wrong neck! I also used this bass in Street Crocodiles when playing live as it was fast and lighter than the Musicman.